Once I received Sophie and Brandt in my September Julep Maven box, a couple of neutral shades, I knew I wanted to do something modern and a little Art Deco. I went with a chevron French tip (my beauty profile is "Classic with a Twist", after all). Sophie is a "chic truffle mushroom creme" and Brandt is an "opaque off-black creme". Both are part of the Julep x Trina Turk Fall 2012 collection. I didn't have a mushroom shade yet, and I like how it looks. Sophie is a nice, creamy greige. Brandt is so dark that you can't really distinguish it from actual black, so I think I could've done without it. I'm really loving Julep's creme formulas though. A couple of coats and they're completely opaque. To get this look, paint two coats of a taupe or mushroom shade (I used Julep's "Sophie") and let dry. 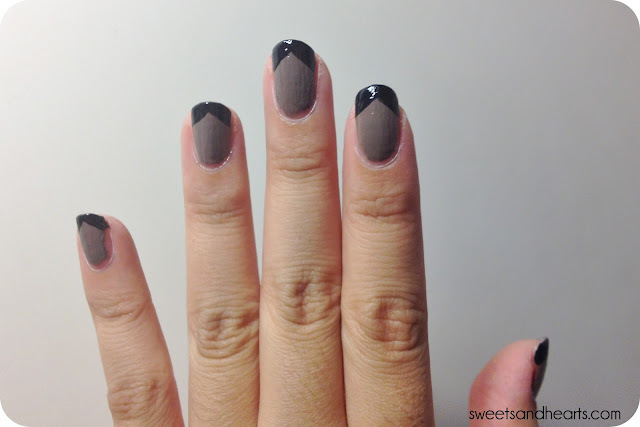 For the chevron French tip, use a dark charcoal or off-black shade (I used Julep's "Brandt"). Holding the brush at an diagonally on the tip, carefully paint a thin angled stripe starting from the outside of the nail towards the center. Repeat on the other side of the nail so that they meet in the middle and make a point. Seal with a topcoat (I just bought Seche Vite and can't recommend it enough--my nails last way longer and are chip-free for a whole week. Dries fast with a shiny finish). 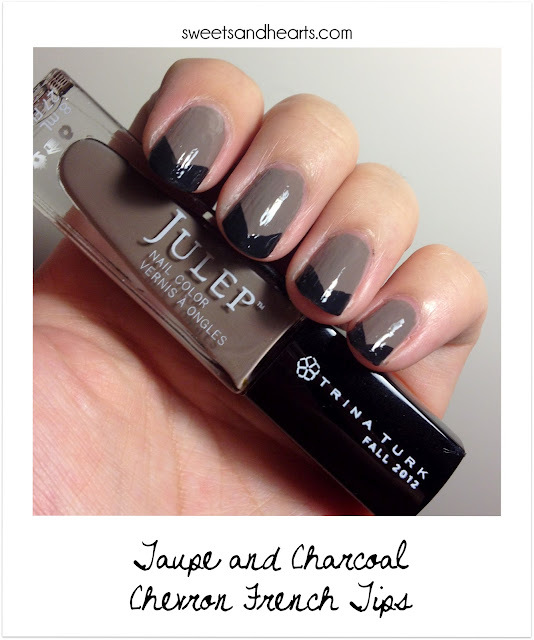 I'm a member of the Julep Maven program and received these polishes in my September "Classic with a Twist" box. Feel free to use my referral link if you're interested in joining the Julep Maven program too. You can try your first box for just a penny (normally $20 a month) if you use code COLOR2012.